Tweak your lead data to work the way you want it. 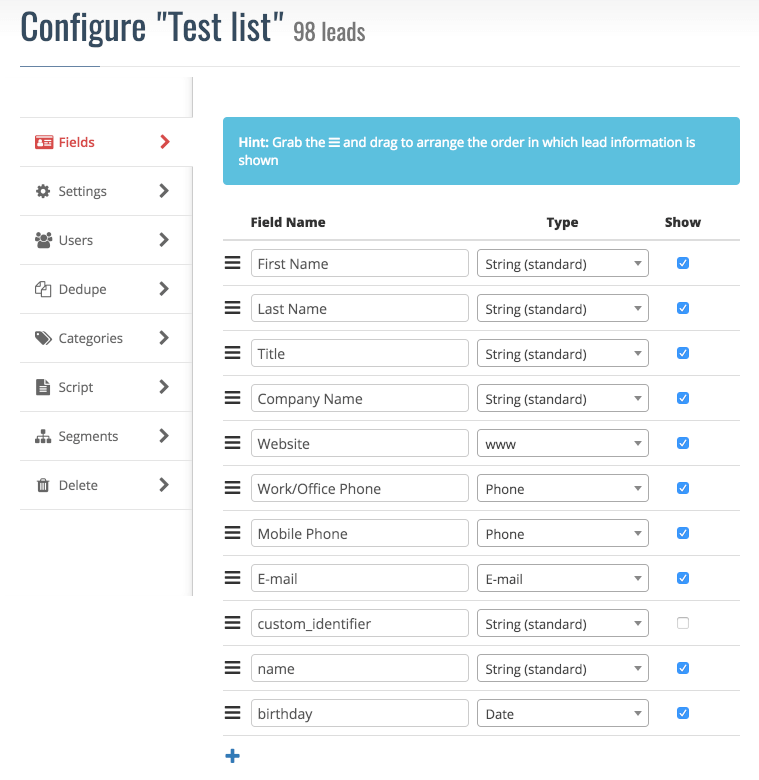 Once you have uploaded a file with leads or created a new, empty list, you are taken to the list configuration page. The first thing you need to do here is review and configure or define your lists' fields. You add new fields by clicking the + icon in the bottom of the fields list. You remove fields by clicking the bin that appears next to the field definition when moving your mouse over it. (Users on mobile devices just tap the empty space next to the 'Show'-column). The first three fields are used as part of the lead identification. These fields are always shown, for example in your call log or in your queue. The rest of the fields are only shown when you are working that lead, so make sure the three top fields are ones that enables you to uniquely identify a lead. These fields are typically something like Name, Title and Company. You order the fields by dragging them in the three-bar handles to the left of each field definition. You will want to carefully review the type of each field. Setting the right types will enable you to easily click on that field when viewing the lead to visit their website, send an email or start calling. Setting field types also allow for easier and/or more consitent editing, as well as improved segmentation capabilities. String: The standard type. Normal text on one line. Phone: Will turn the field into a link that launches your phone when clicked. Central to the myphoner core functionality. E-mail: Will turn the field into a link that launches your email client. www: Will turn the field into a normal web-link. Yes/No: Will turn the field into a checkbox and allows for segmentation on whether this field is true or false. Existing values should be '1' for true and '0' for false. Number: Will only allow number input in this field and allows for segmentation with greater than and/or less than a given value. Date: Will turn the field into a date-picker and allows for segmentation with greater than and/or less than a given date. Multi-line Text: Will allow for multi-line editing of this field and shows the content using markdown syntax. Street Address: Will turn the field into a link that looks up the address in google maps. Defining fields in myphoner. 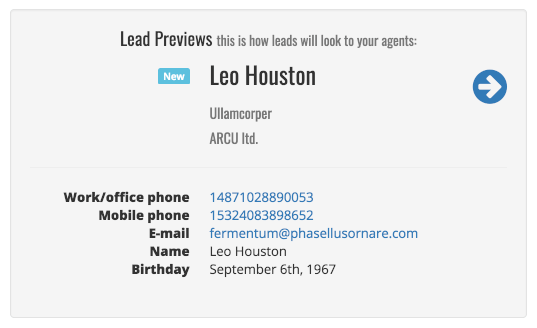 This is where you name, categorize and order your fields for use when viewing the leads. Make sure you have given your phone and email data the right type to get the best possible experience when using myphoner. Fields with types 'Phone' and 'E-mail' are used for duplicate detection and they are indexed a little different in order to make them easier to search. If you have added one or more leads to your list, the lead preview to your right is updated with every change you make. This way you can easily see if your change has the desired effect. Use the blue arrows to cycle through different leads to see more examples of how the data fits your configuration. Hint: Go ahead and click on the phone number in the preview, and see if it launches your locally installed phone. If not, you might need to do some troubleshooting before you are ready to call. Pro Tip: Using the email link of the lead will automatically put your myphoner Email Dropbox address in the bcc field and thus record that email to the activity log in myphoner. Previewing a lead in myphoner. The order of the fields and whether they are clickable are determined from the field configuration (above).